Are you ready to prepare the chinese wedding invitation? You can start preparing your chinese wedding invitation once you have decided on the wedding banquet dates and reserved the restaurant. Some hotels or restaurants will provide blank wedding invitation cards for a certain percentage of the number of guests as part of the wedding banquet package. The couple will usually need to pay for printing of the cards themselves. If you are not satisfied with the wedding invitation cards provided in the wedding banquet package or there is none, you will need to source for the cards yourself. 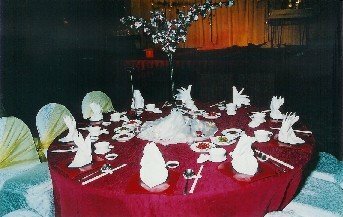 Would you like a memorable mid-autumn chinese wedding banquet? As it is customary to issue chinese wedding invitation at least two to four weeks in advance, you will need to select the cards eight to ten weeks prior to your chinese wedding, if not earlier. - proof-read the prototype before final printing. Chinese wedding invitations were traditionally red but due to western influences pink, cream, maroon, purple, magenta, etc are also becoming popular. Colors of mourning such as black, blue and green are avoided. Gold or silver fonts are popular choices although other colors are also used to match the card. One fold, two fold, centre fold? For standard single fold wedding invitation the english invitation wording will be printed on the left and chinese wording on the right. For cards folded two times it is easier to distribute the vertical chinese text over the two smaller panels. To avoid confusion, keep the main text on one panel and have the venue and program information on another. 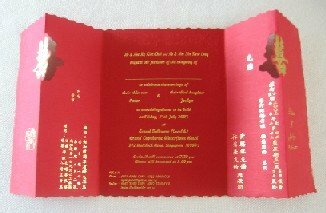 Chinese wedding invitation wordings are layout vertically and read from right to left. Find out how to write your own chinese wedding invitations! if available at the time of issuing invitation. Remember to include a map of the dinner venue and other helpful information for getting there. Dress code, if any, should also be indicated. An RSVP response with indication for number of attendance and special meal preferences is also useful. In this PDF file you will find a sample chinese wedding invitation. After the betrothal, the bride¡¯s and groom¡¯s parents will distribute the chinese wedding invitation for the wedding banquet and wedding cakes to their close relatives and friends. It is also acceptable to distribute chinese wedding invitations by post. Ehh¡­there's no where to write the guest¡¯s name? 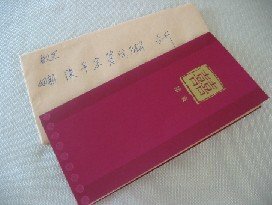 For chinese wedding invitation, the guest name is written on the envelope only. The guest¡¯s formal title will be used. Remember to indicate if you are inviting the guest¡¯s spouse [夫妇]，[伉俪] or whole family [阖府统请]. If you are inviting the whole family, then do follow up with the guest on how many seats to provide. Usually [升] or [台升] is used after the name as a form of respect to the guest. [升] described the upward movement in presenting the invitation card from a lower position. [台] is an honorific used in polite language to address one¡¯s male friend or male acquaintance. Learn how to address chinese wedding invitation envelopes. What if you also have a church wedding and reception? If you have a church wedding and reception as well as a wedding banquet you will probably have different groups of guest for both events. To avoid confusion, you are better off with wedding invitations for each event rather than just one for both events. Hopefully you are not having it on the same day or you will definitely be pressed for time and the logistics would drive you nuts. What if you are having not just one but two wedding banquets? 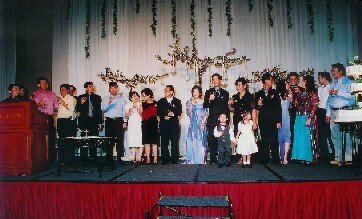 Sometimes the bride and groom are from different countries or the bride¡¯s parents decide to throw a separate wedding banquet for their friends and relatives. For chinese, preserving the face of one¡¯s friends and relatives is very important. Some may think having more guest means being more influential and wealthy. Some feel that if the bride¡¯s side has too many guests compared with the groom¡¯s side it will embarrass the groom¡¯s parents. So when the bride¡¯s parents has so much more quest to invite that the bride¡¯s and groom¡¯s quest are unable to balance out the numbers, they may choose to have separate wedding banquets. In such cases, you will need a set of chinese wedding invitation for each wedding banquet.